Quick and effortless grooming is a must for the holidays. Get ready to look good from head to toe all season long with 5 men’s essentials conveniently packed in our exclusive MONAT Men’s Weekender Bag. Grab a bag, and cheers to good hair, and good times in style. MONAT Black Cream Shave – 178 ml ℮ 6,0 oz liq. MONAT Black After-Shave + Moisturizer – 100,5 ml ℮ 3,4 oz liq. MONAT Black Groom Styling Clay – 50 ml ℮ 1,7 oz liq. Holiday Beard Grooming Oil, Light Wood – 50 ml ℮ 1,7 oz liq. A rich and soothing cream shave that leaves skin smooth, sleek and revitalized. Provides a close, comfortable shave. Helps to soothe skin. Moisturizes skin, making it feel silky, never greasy. A rich and velvety Aftershave + Moisturizer that helps to soothe skin, minimize ingrown hairs and provide excellent skin hydration. Helps to prevent moisture loss and refine the appearance of fine lines. Expertly crafted, quick-absorbing oil for all beards and moustaches. This 4-in-1 oil has been specifically formulated with nourishing, conditioning, lightweight oils to keep your beard and moustache hair hydrated, whiskers in line, and the skin underneath it soft. Also doubling as an ideal pre-shave oil, it keeps skin protected and allows razors to glide smoothly. Never over-powering, delivering ultimate shine, softness, smoothness, beard hair protection…and more. Suds up for squeaky-clean skin with this exfoliating body bar specially formulated with fresh coconut and activated charcoal. Fused together to purify, absorb dirt and deeply cleanse, while leaving skin nourished, hydrated, moisturized and feeling soft. 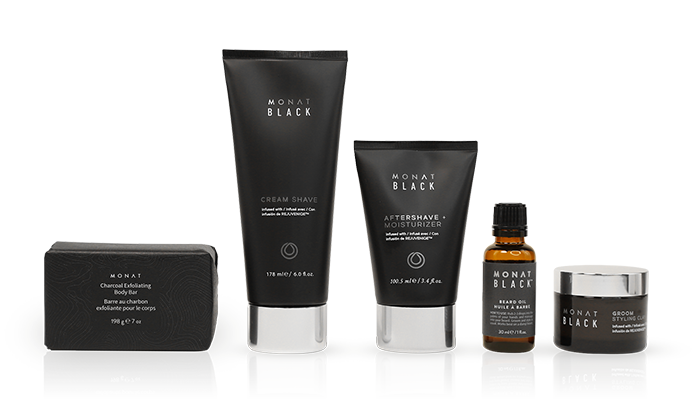 MONAT Black Cream Shave– Apply to skin, shave, rinse. MONAT Black After-Shave + Moisturizer– Apply to face and neck after shaving. MONAT Black Groom Styling Clay– Apply to towel dried hair or dry hair. Style as usual. Charcoal Exfoliating Body Bar– Massage over wet skin in the bath or shower. Rinse clean. Holiday Beard Grooming Oil, Light Wood– Rub 2-3 drops into the palms of your hands. Massage into beard or mustache. Groom and style as usual. SHOP MONAT NOW – as a new VIP you will get to choose a free ONLY FOR YOU product as well, worth $25! Previous Post Moisture vs. Hydration … What’s What?